If you have a life, you have a story! 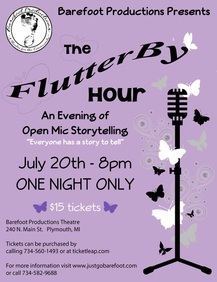 The FlutterBy Hour is a unique opportunity to open up and share your life experiences with an engaged audience. Whether you're an experienced story teller, a newcomer with something to divulge, or a attentive listener open to the expression of others, join us for a memorable evening in an intimate setting.